In need for a subject to paint in watercolor, I decided to revisit a design worked in oil paints a couple years ago. 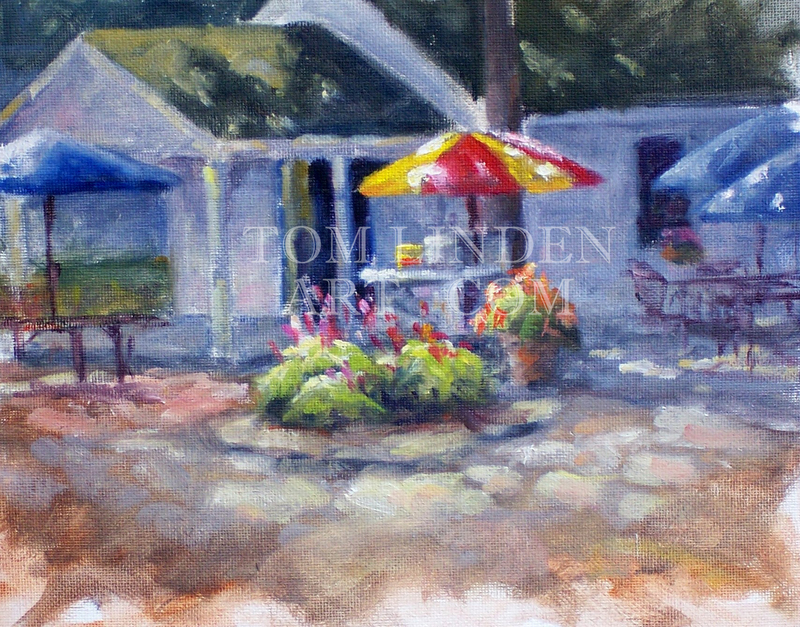 It is a challenge to move from oils to watercolor or vice-versa. The need for good planning is magnified with watercolors. Critical to preserve the whites as long as possible. Vital to intensify the initial applications of paint to minimize the chance of mud invading the painting. On another note, I decided to clean out some inferior works from the studio. Nearly forty paintings on panels and almost two dozen paintings on stretchers bit the dust. Fresh canvas attached to the stretchers and many of the panels recycled to be used in the future, hopefully to more successful results. Traveled to Door County for a weekend get away. Saturday we made our way over to a beach in Fish Creek. Had a picnic then, while my wife was reading a book and enjoying the sun, I sketched some kayaks setting on the beach. 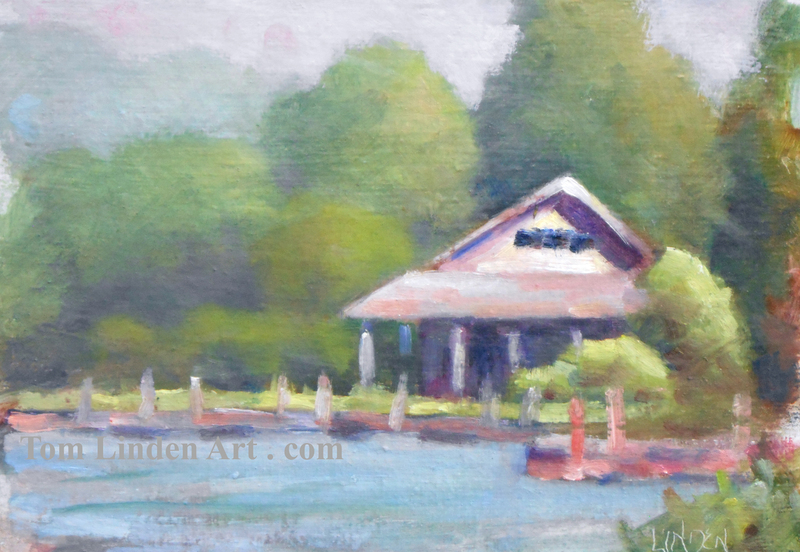 Later I captured a quick little painting of a nearby boathouse. Played with this design of Malibu Moo’s, a location across from Clark Park in Fish Creek. The painting which I had attempted earlier in the day had not gone well. It was a nice to get this done. While I painted, I noticed my wife chatting with some folks near the harbor. Did not surprise me to find out that they were teachers. Anyway, it kept my wife busy long enough to allow me sufficient time to finish this painting. 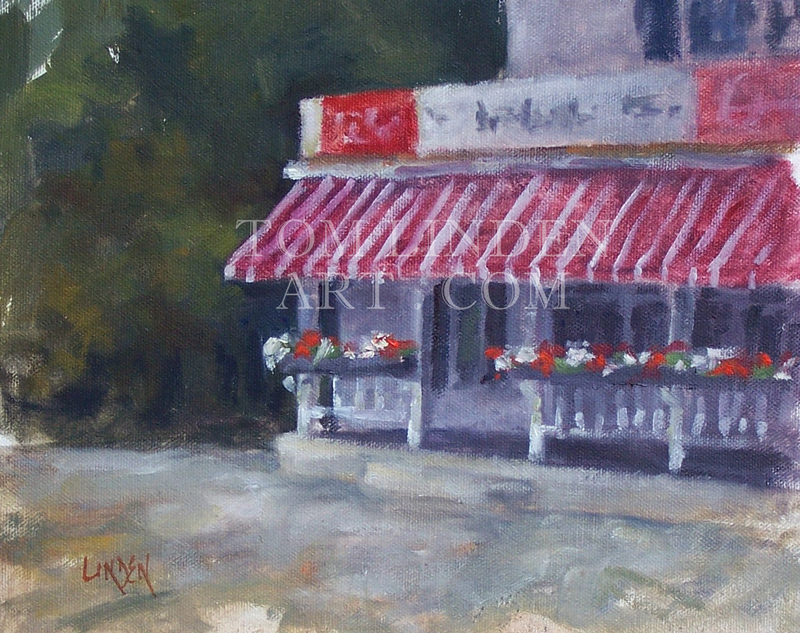 After lunch, we made a couple quick stops and then up to Ephraim to get a painting of Wilsons. Due to time constraint, I neglected to include people (which are ALWAYS around this establishment). Oh well, maybe next time.